Having played sports most of my life, I like to encourage others to give any game a try. When people say they are “uncoordinated” I question that – I tend to believe that with patient instruction and time, learning a new skill is within reach. This comes from my own experience teaching and coaching sports. Even when I taught the fast-paced sport of racquetball, I saw success from people of all ages and abilities when they accomplished my only requirement: showing up. Fast forward to now. I provide part-time care for a young man with special needs. I take him bowling once or twice a week. Due to awaiting shoulder surgery on my dominant right arm, I can’t even lift a bowling bowl. 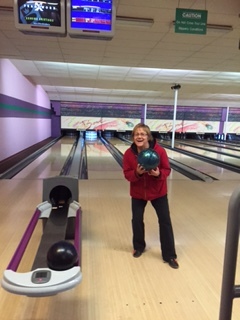 Recently, Tom (not his real name) talked me into bowling… left-handed. Yes, I can do this. I would have to make adjustments. My footwork will be opposite. I will stand on the opposite side of the lane. I will need a lighter ball. Yes, yes, I can adapt. I practiced my footwork, and… almost tripped over myself. It’s confusing! I found myself turning my wrist across my body. I watched that ball head right into the gutter. Almost every time. “No, No! Not in the gutter! Throw the ball down the middle!”, Tom yelled. Yes, this is what it feels like to be a beginner in sports. This is one excellent sneak preview into why people aren’t crazy about physical activity and would prefer the life of a couch potato. It’s humiliating, frustrating, and feels like everyone is watching. I want to hide – I hope no one sees me! The marketing world doesn’t help. We go from December 24th sale flyers of Christmas goodies to December 26th sale flyers of fitness equipment, modeled by none other than perfectly chiseled bodies. These specimens bore no resemblance to the general public I saw in the gym in the first days of January. Yes, starting physical fitness is a struggle! If you think it isn’t, give yourself a challenge to make it a brand new experience, such as playing your sport opposite-handed. By the way, if you laughed at my 20 score, please know that Game Two was better. I sought help from a young man at the bowling desk. He gave me some excellent tips and I quadrupled my score. Bottom line – when it comes to being physical, the key is to start somewhere – even if that place is in the gutter.